For several years, the model for the transduction of G protein-mediated signals consisted of three components: a heptahelical receptor, a heterotrimeric G protein, and an effector (1). The heptahelical receptor, which spans the membrane seven times, is coupled to a G protein complex consisting of an a-subunit in the guanosine-5'-diphosphate-bound form (a-GDP) and a Py-dimer. Upon agonist binding to the receptor, a conformational change occurs in the G protein a-subunit, which leads to the release of the GDP and the binding to guanosine-5'-triphosphate (GTP). The a-GTP has lower affinity toward the Py-dimer, releasing it from the G protein heterotrimer complex (Fig. 1) (1). Both a-GTP and Py-dimer are known to regulate a wide range of effectors (2). All subunits of Ga possess intrinsic GTPase activity, but the rate of GTP hydrolysis from the a-subunit alone is too low to account for the duration of G protein signaling observed in many physiological processes, such as visual transduction or ion channel modulation. The discovery of the regulators of G protein signaling (RGS) has helped to explain the difference in timing of the G protein-mediated responses. G protein-coupled receptor (GPCR) kinases (GRKs) and RGS proteins are involved in the termination or desen-sitization of G protein-mediated responses (Fig. 2). GRKs work at the receptor level by phosphorylating receptors in their active, ligand-bound form, uncoupling receptors from G proteins (3). 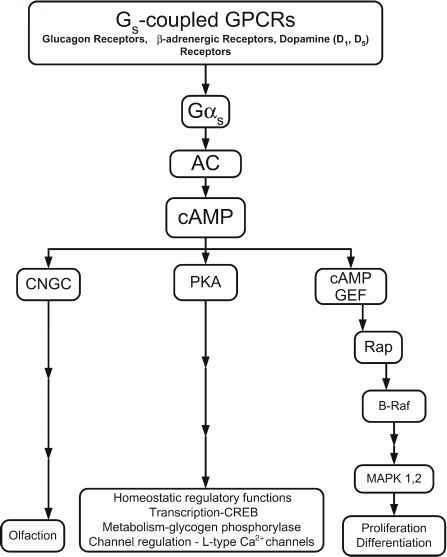 RGS proteins act at the G protein level by accelerating the rate of GTP hydrolysis (Fig. 1) (4).